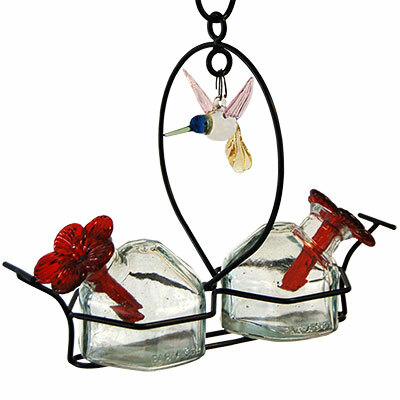 Wild Birds > Bird Feeders > Hummingbird Feeders > Blown Glass, Small, <8oz. View an adorable hummingbird in your backyard all summer with the Parasol Bouquet-2 Deluxe Hummingbird Feeder with Ornament. This charming piece provides the "flying jewels" a wonderful dining spot, while bringing elegant style to your setting. The classic black frame houses two hexagonal glass vessels, a perch on each end offering resting spots. A wide circle at the frame's center draws attention, and the blown glass hummingbird figurine suspended here forms a focal point. The lifelike pose, textured wings and tail, and hints of color on this figurine lend striking realism to it, and it moves in a slight breeze to mimic the flight of actual hummingbirds. Each clear glass vessel holds 3.5 ounces of nectar, and a red flower in the neck of each completes the look. These reservoirs remove from the frame in moments for cleaning and refilling the unit, and the included, 2.25" long "S" hook makes hanging the item simple. Made from recycled glass, this feeder lends a touch of environmental consciousness to your yard, as well as natural style. Add the joy of hummingbirds to your yard with this Bouquet-2 Deluxe Hummingbird Feeder with Ornament.